Ergonomic design makes it easy and simple to operate! 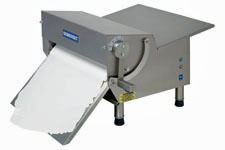 Sheets dough to a uniformed thickness in seconds! 20" & 30" Fondant Sheeters, Ideal for rolling fondant sheets and decorations. Ideal for cake fondant, sugar icing and sugar paste, wedding cakes, pizza, pasta, dough lamination, pastries. May also be used for Pastry production. Finishing is: ALL STAINLESS STEEL. A complete solution for wedding cakes. Synthetic rollers eliminate dough build up, Safety sensors for automatic shutoff, compact design, ideal for use in limited space, Sanitary and heavy duty with all stainless steel welded construction. Spring loaded scrapers for easy removal for easy cleaning. Scrapers: Synthetic spring loaded and removable. Simple handle adjustments for exact uniform dough thickness. Ergonomic design makes it easy and simple to operate. Drive mechanism isolated from roller area. Safe & simple and easy to operate! Gear motor: Heavy duty 3/4 hp, 1 phase, 115 volts, 60 hz. or 220 v/50 hz. Discharge: Large all stainless steel tray.